Conventionally, the lower cost residual fuels are used for large slow speed diesel main engines and generators are operated on the lighter more expensive distillate fuel. The addition of a small amount of diesel oil to heavy fuel considerably reduces its viscosity and if heating is used to further bring the viscosity down then the blend can be used in generators with resultant savings. 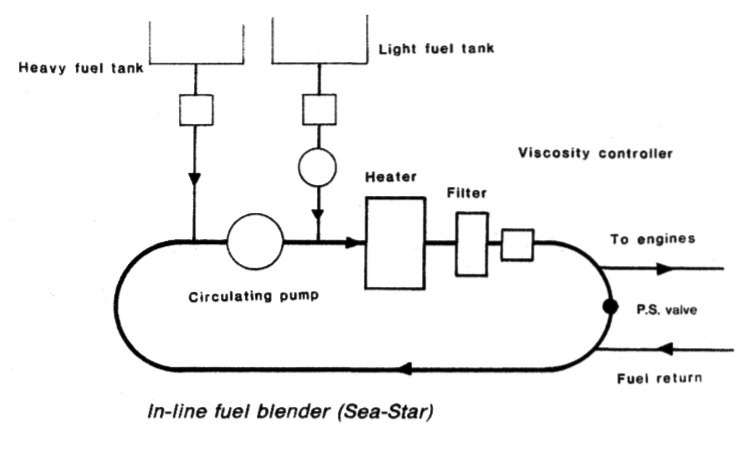 The in-line blender shown in Figure below takes fuels from heavy oil and light diesel tanks, mixes them and supplies the mix directly to auxiliary diesels. Returning oil is accepted back in the blender circulating line. It is not directed back to a tank where there would be the danger of the two fuels settling out. Fuel is circulated around the closed loop of the system by the circulating pump against the back pressure of the p.s. (pressure sustaining) valve. Thus there is supply pressure for the engine before the valve and a low enough pressure after it, to allow returning oil back into the loop. Sufficient light diesel is injected into the loop by the metering pump for light load running. As increased load demands more fuel, this is drawn in from the heavy oil tank by a drop in loop pressure on the suction side of the circulating pump. The extra fuel made necessary as the load increases is supplied from the residual fuel tank. At full load the ratio may be 30% diesel with 70% heavy fuel, A viscotherm monitors viscosity and controls it through the heater. The hot filter removes particles down to 5 micron size and there are other filters on the tank suctions. Constant circulation and remixing of the blend and the returning fuel prevents separation. The diesel is started and runs light on distillate fuel. As the load increases, heavy fuel is added.